View our current in-progress projects. 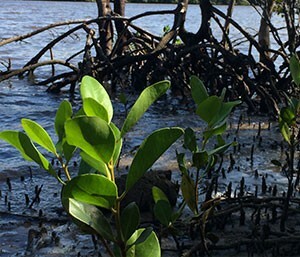 A new residential development located on an estuary of a Gold Coast River is being transformed to incorporate a 50m wide conservation zone that will enhance and protect sensitive inter-tidal veg communities. Restoration works are staged around the construction program to allow transplanting and propagating of key species under permit. 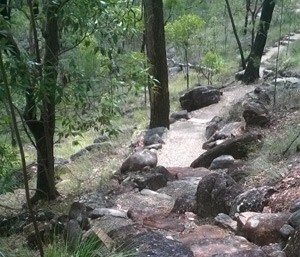 Bushcare Services construction team have upgraded a number of walking tracks in this large bushland park south of Brisbane. Works involved re-grading and surfacing degraded sections of the tracks, installing drainage and installing treads. Check out the before and after photos and the quality workmanship. 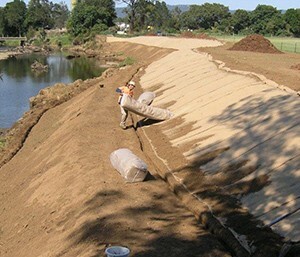 Continual bank de-stabilisation on this stretch of River has resulted from changes in upstream land usage. Major flooding events have since undercut these sandy and dispersive soils – which now requires an adaptive in-stream restoration approach. This residential estate on the Gold Coast has protected and rehabilitated significant portions of riparian vegetation and integrated opportunities for nature based recreation. Changes to site drainage during civil construction had consequently affected some local flows through bushland. 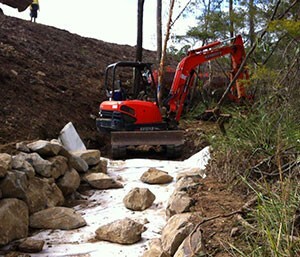 Bushcare Services re-established a robust drainage line with rock construction and check weirs whilst protecting native trees and transplanting affected vegetation. Seasonal flows are now mitigated and the area is a natural asset.